The Collini Case is a novella: 160 or so pages of large type, with each chapter starting on a right-hand page (so plenty of white space). Therefore, any review is likely to give away too much in advance for the reader of this brief tale. The centrepiece of the book is a courtroom drama. The defendant, Collini, is an Italian who has lived in Germany for all his adult life, first as a guestworker. As the book opens, he enters a hotel and, on the pretext of being a journalist, brutally kills an elderly industrialist millionaire. Collini does not try to escape, but he won’t speak to anyone, either. The pleasures of the story are in the procedural details of the case (including a few pages of detail about the post-mortem which are hard to read if you are the slightest bit sensitive). The defending lawyer, Caspar Leinen, is a young idealist; part of the book tells his life-story and his connection with the victim’s family, which is very poignant and well done. As a defence lawyer, of course, Leinen feels a moral obligation to find out why Collini committed the crime, even though Collini himself will not speak. Eventually, he thinks he has found a clue, but inevitably simply discovering the truth is not going to be sufficient to see that justice is done. Perhaps the revelations near the end will not come as a surprise, but they are nevertheless moving and powerful. 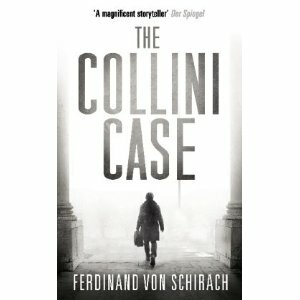 The Collini Case is an extremely readable book, ably translated by the highly honoured Anthea Bell. It is easy to see why it has been a bestseller in Germany since it was first published there in 2011. I obtained this book via Amazon Vine. Spiegel online: fascinating article in which the author discusses his grandfather’s past. I recommend not reading it unless you don’t mind knowing in advance what this book is going to be about. YouTube video about the book. Sounds very attractive to me, Maxine. Thanks for the warnings. Great review Maxine. I’ve just been given a review copy at Harrogate and you’ve made it sound very tempting. I will definitely be reading it. Maxine – Terrific review as always, for which thanks. This does sound tempting. And I am so grateful you took the extra trouble to be careful not to leave spoilers. Some books make that harder to do than other books do, and I appreciate that you took the effort. I’ll try to find this book. I do admit that after reading and contemplating reading these 400-page tomes, a short book is tempting. I’m reading Witness the Night and finding it so disturbing, though well-done, that I may need some comedies after this rather than anything heavy. It’s very harrowing to read. I know that it won the Costas Prize and got a lot of recognition. I think I read about it right here. I think I won’t be able to pass it along to women-reader friends, as they’d be too upset by the content, although, sadly, it’s based on reality, I’m sure. The author, Kishwar Desai, has a new novel out about the highly unregulated surrogacy industry in India, where there is little regard for the woman involved. It sounds fascinating. Sorry that I’m blogging off-topic here. However, the reaction to reading this book is not unlike watching The Whistleblower, about human trafficking in Eastern Europe. One wants to pick up and run out and do something! But there are people — women — working on these issues in India, to my knowledge. I understand the feeling of being “too close to home”, Kathy, I’ve experienced it myself in two or three books I’ve read recently, & find it hard. When I read Witness the Night I didn’t know anything about it, and did not realise it was going to have such a hard-hitting and tragic theme. But I am glad I read it. Thanks for the great review, Maxine. Had started reading the German version but then got sidetracked. The author’s family history certainly provides a fascinating extra dimension to the novel. Will check out the Spiegel article once I’ve finished as you suggest. I’ve just read this book, Maxine, for crimesquad so the review won’t be on my blog. What a sad story. And so much detail and information has been packed into 160 pages. I sort of guessed where the book would be going from the start but it didn’t spoil the story at all. I totally agree, Sarah, I thought it was very sad and showed what can be done in the novella format – just as powerful, maybe more so, than many a longer book. I agree it was not a big surprise, but still moving and engaging.